This is an extremely effective riff using a combination of fingered notes and slide from Mississippi Fred McDowell. I have used an open E tuning for this one but on the original recording Mississippi Fred is tuned closer to F - these old style bluesmen didn't have tuners so if you want to play along with any of these old recordings be prepared to tune to almost anything. The basic tunings of open D and open G can be pitched up or down to suit the vocal range of the artist. Open E tuning is the same as open D but pitched up a tone. 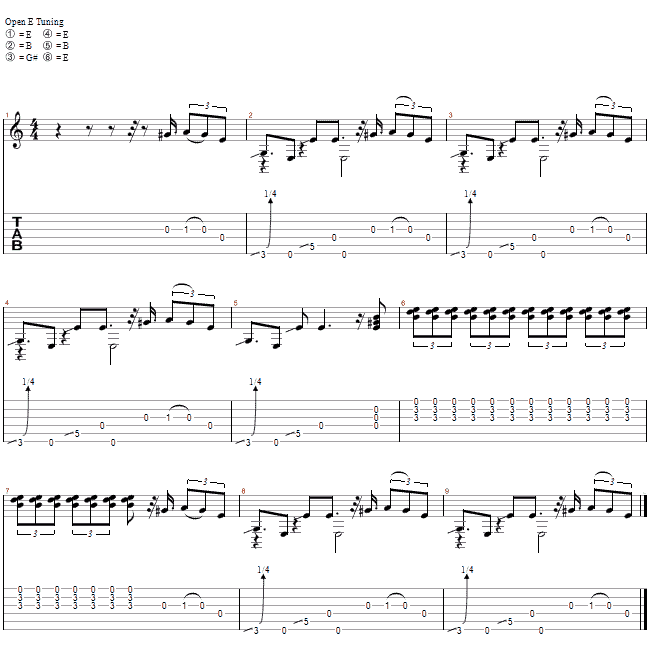 As well as the riff the original has many other phrases - some using slide and some fingered. ( bars 6 & 7 in the tab ). This phrase and the chord used ( E7 ) are very common in this style.